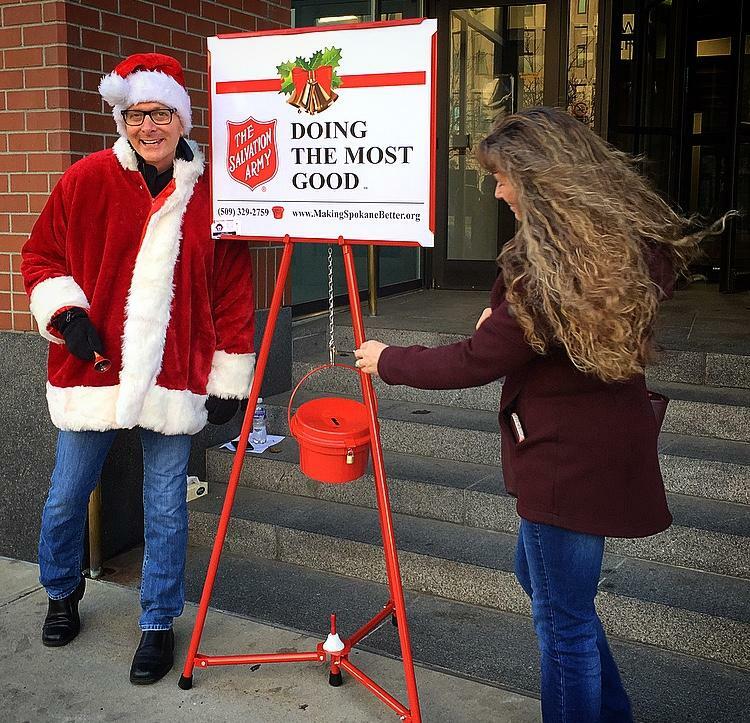 Fri., Dec. 22, 2017, 12:01 a.m.
You learn a lot about people when you stand outside on a cold day, ringing a bell in front of a red kettle. For me, it wasn’t in front a grocery store or a department store. Or someplace you might expect to see this sort of iconic holiday image. It was in front of The Spokesman-Review building. In the middle of the afternoon. On a weekday. Back in the middle of November, folks from across our company took turns ringing the bell to raise money for charity that day. The day was split into hourly shifts so the different department heads and executives from our building could both shiver and make a little noise. Everybody looked the part. Ties. Suit jackets. Nice coats. We’ve all watched enough movies to know what the “boss look” is. If you ever need an example for a great corporate-leadership photo, we can take one for you. We totally look the part. It’s a question that’s been music to my ears since I was a kindergartner. And, yes, I was going to wear a full Santa coat with the matching hat while I stood in front of the handsomest building in Spokane. The first person who walked by stopped and looked at me. Then smiled. In this profession, you learn quickly to dodge that question after an election year. But we both knew Kris Kringle doesn’t typically wear Buddy Holly-looking eyeglasses. And though I’m not in great shape, I’m nowhere near 260 pounds. He knew I wasn’t Father Christmas. We both smiled as I watched him put a creased $5 bill into the kettle. I thanked him and told him to stay on the straight and narrow because my police reporter said he was dangerously close to being on the naughty list. He laughed and headed down the sidewalk. This was going to be easy. If the rest of the day was anything like the first two minutes, that red kettle wasn’t going to be anywhere near big enough. It didn’t take long to realize it was going to be much harder to get other people’s attention that day, let alone hope they donated money. Most wouldn’t even make eye contact with me. They flat-out ignored me. Here’s this tall, skinny guy with a goofy face, dressed in ridiculous clothes, ringing a bell in front of a building that looks a little like a castle. How can you possibly ignore that guy? On second thought, maybe it’s better not to engage with a fellow like that. If only I had a bigger bell. As the parking spot opened up on the street right in front of where I was standing, an elderly woman pulled into the spot and tried to figure out how to work the parking meter. It still had some time on it, but she reached into her purse to grab some change to put into the kettle, only she couldn’t find any. “I’ll be back,” she said as she hurried to wherever she was going. I’d already heard that before. And guess what? No one ever comes back. Seriously, how can you fib to Santa Claus? These people were definitely going on the naughty list. Glancing at my watch, I was relieved to be heading back inside in just a few minutes. I was cold and couldn’t imagine why I used to dream of winter when I was kid. Looking up, I saw the woman I’d talk to earlier power-walking towards me. I mean she was really moving. It was impressive. And she was also about to jaywalk. One of my favorite guilty pleasures is to watch people break minor laws. In broad daylight. Especially right in front of a newspaper building. “I was hoping you were still going to be here,” she said as she practically ran to me. She fumbled a bit as she folded a $20 bill to put into the kettle. I told her how nice that was and thanked her. We talked for a few more minutes. My day had been made. Is there anything better than witnessing a moment of kindness? The only thing that might be better than seeing people commit acts of kindness is being able to tell others about those selfless moments. That’s what makes this one of my favorite times of year. Last year, The Spokesman-Review debuted our “Difference Makers” project. It was a way to make sure that those who have done remarkable things for our community over the last year – often times in a remarkably quiet fashion – get the accolades they deserve. It has always drove me crazy that it seemed like the easiest way to get on the front page of a local newspaper was to do something awful. It feels like at most traditional media organizations, news is defined by just how terrible the story is. The worse the story is, the bigger the headline. Well, good news is news, too. We found amazing people to write about for the first year of “Difference Makers.” Our readers loved those stories. And we loved telling them. So this year, we decided to ask our readers who they thought we should name as Eastern Washington’s “Difference Makers” for 2017. The nominations kept coming and coming and coming. And they all were so good. For the next 10 days, we will honor them on our front page. But to be honest, we had enough good ones to carry us throughout most of next year. Nearly all of the stories you’ll read over the next few weeks were suggested by members of our community. It reminded me of ringing that bell while standing next to that red kettle. Just when you wonder if anyone cares, someone walks up and shows you so much compassion that you can’t wait until you’re asked to do it again. And just wait until you see how I’m dressing next year. Published: Dec. 22, 2017, 12:01 a.m.